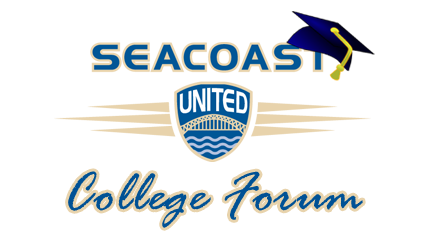 Seacoast United hosts an informational night each year to assist student athletes as they transition from high school to college. Seacoast United encourages athletes to attend who are interested in playing soccer or field hockey at the college level. There will be presentations to help parents and players better understand the financial aid process, scholarship options, and the admissions process/criteria. SUSC will also have soccer and field hockey representatives from D1, D2 and D3 college programs, as well as current collegiate players to give their perspective, feedback ,and answer questions. While there is no cost to attend the SUSC College Forum, we do ask all interested parties to please register to assist us in planning for the appropriate number of attendees. Please click here to register!